want to save even more on your next Subaru? Subaru Of Twin Falls is now part of the Costco Program! Whether you are shopping for a new or CPO Subaru, or simply need to service your existing vehicle, the Costco Auto Program will help you get additional discount on your next purchase. How does the Costco Auto Program works? Costco's Auto Program is a great way for Costo members to purchase a new or used vehicle at a discounted price. First research your vehicle them submit your request directly on the costco website, then the dealer will contact you with your prearrange price. To begin, visit the 'Subaru Vehicle Research ' page to conveniently and easily search, read vehicle reviews, compare specs and features and view photos. You can even research safety information and review the Subaru manufacturer incentives. Select a new Subaru and locate Subaru of Twin Falls within the Costco Auto Program page. Shortly after submitting your request, we will contact you and follow up to schedule an appointment at the dealership. Coscto will also provide you with our information, should you prefer to connect us at your convenience. Once you are at the dealership, we can help you select your preferred vehicle. 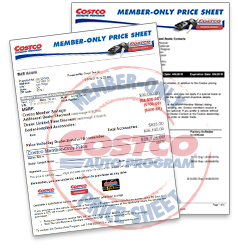 View the special Costco Member-Only Price Sheet which shows your exclusive prearranged price on the vehicle you selected. Stackable Savings on New Subaru vehicles. Costco members can save more on the purchase of their new Subaru by combining prearranged Costco Auto Program pricing with our Limited-Time Specials and Nationwide Subaru Incentives. Costco members will also receive 15% off parts, service and accessories for their Subaru. To receive the discount follow the instruction directly on the Costco Website by following this link.